Here in Southern California, I've yet to find Jack Link's Organic jerky. I mean, there's tons of Jack Link's regular jerky, but finding their organic line has been tough. And since a number of you have wanted to see more organic jerky on here, and even one person wanted to see more Jack Link's reviews, I sought about finding more organic stuff. I finally found a bag of Jack Link's Organic while visiting Washington State earlier this month at a Greenfresh Market in Renton, WA. It carries the USDA Organic seal, and says that it's also certified organic by Oregon Tilth. In the few brands of organic jerky that I've had thus far, there's isn't any kind of benefit in taste or texture that I can tell. It's mostly just an ideological thing, or religious thing, or political thing. I dunno, since I'm not necessarily into the organic thing. *Beef, water, *evaporated cane juice, *soy sauce powder (*wheat, *soybeans, salt, *maltodextrin), *corn syrup solids, salt, *black pepper, *garlic, *onion. The tastes I get from the surface is a slight sweet flavor followed by a smoky flavor. There's also a faint saltiness. Moving into the chewing, I don't really taste any much more. Mild, bland, tasteless, are words that come into my mind with this jerky. I think that after a few pieces, the predominant taste of this is the salt. It's a mild, light tasting saltiness. I don't really taste the "soy sauce powder", or at least I can't detect the taste one usually identifies as soy sauce. If there's a secondary taste, it would be the slight sweetness off the surface, with the third taste being the smokiness. For the most part, I don't really find any meat flavors in this. However, I did find some smaller, moister pieces, that did give off a light taste of meat. Some pieces had streaks of fat, or a decent amount of marbilization, that gave off a more "beefy" taste. Overall however, this jerky offers almost no natural meat flavors. As for the black pepper and garlic mentioned in the ingredients list, I do sense their aftertaste in the back of my mouth throughout eating these pieces, but even those are light tastes as well. 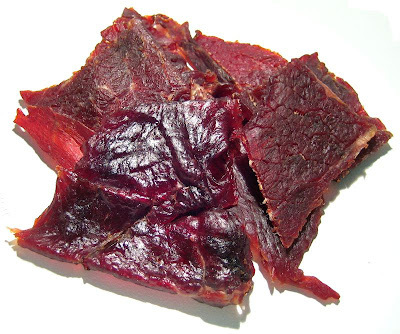 This is a soft and tender style of jerky that retains a slight bit of moisture. These pieces are all easy to tear apart and easy to chew. The chewing experience is rather lackluster, not really providing a steak-like experience. Even though it's whole meat, it seems to chew more like a chopped & formed jerky. There's a large piece depicted in the photos below that has a very gelatinous texture, like "gummy jerky". That piece chews like soft rubber. It's a fairly clean jerky, though it leaves a very fine film of oil on my fingers, but nothing that needs to be wiped off. However, that one gelatinous piece has more oil than the others, and did require some finger wiping. I also found a fair amount of fat on these pieces, including some with a good amount of marbilization. But otherwise no tendon or gristle. I paid $7.99 for this 3 ounce package at a Greenfresh Market in Renton, WA. That works out to a price of $2.67 per ounce, making this an expensive buy. For general jerky snacking purposes, it has a poor value. It's bland taste, lack of meat flavors, and lackluster chewing texture, combined with its high price, makes this a difficult proposition for your snacking dollar. Even if it were priced around $1.50 per ounce, I'd find it difficult to justify. 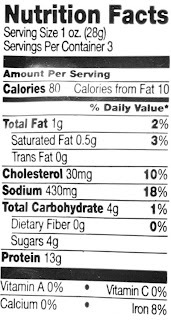 Maybe priced at $0.99 per ounce, I could buy it just as a low-carb/low-fat dieting aid. As an organic jerky, it has better value, since you're getting something certified organic. And since organic jerky is in much shorter supply, it perhaps warrants the higher price, and even though its poor on snack value, it's what you may have to deal with if you want organic beef jerky. 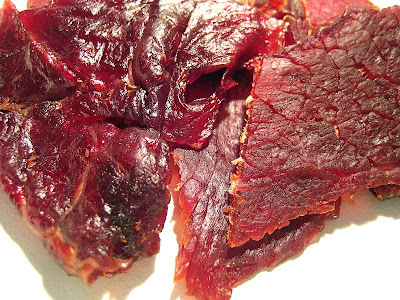 This jerky's only saving grace is that it's easy to eat, and that it doesn't taste bad. But it doesn't necessarily taste good either. In fact, it's weakness in taste, and its lackluster chewing texture takes much of the snackability away from this. If I can't at least find myself wanting another piece, then I can't give it the higher average rating. You'd think that with organic beef jerky one would get a great taste of beef, the way nature intended it to taste, free of any human influence. Actually, of the few certified organic jerkies I've had, I haven't found any that actually tastes like meat. So I guess the folks at Jack Link's need not worry. My beer recommendation with this is a strong flavored, IPA. love your reviews. keep em up. I also found this in my local store, and its indeed not a very good jerky, the one i had was not dried enough in my taste and the soy sauce taste was really dominant.